“Africa is the place to be.” That’s all the buzz in the glass towers and coffee shops of Delhi, Doha, Shanghai and Sandton. And with Africa home to six of the world’s ten fastest-growing economies, the chatter is justified. But where exactly should we be on this expansive continent of 55 countries and 1.2 billion people? Commercial intuition – and a spot of good fortune – might land us in the right place. But luck is hardly the basis for business strategy – we may as well follow the weather. Attractive job numbers, declining corruption and rising gross domestic product (GDP) figures are all handy as discrete factors to consider in choosing investment destinations. But capital allocation is a strategic move of existential import. It is a decision demanding thorough investigation and custom criteria. Introducing Adrian Saville’s Six Factor Model and Pankaj Ghemawat’s CAGE framework. 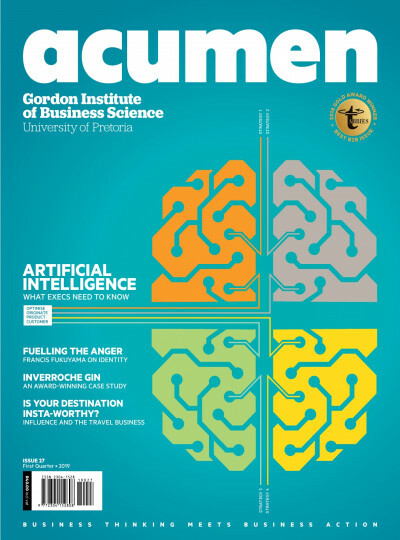 Adrian Saville, professor in economics at GIBS, has spent the better part of a decade on a project – nay, a personal mission – hunting down the factors that explain why and how countries prosper. “We’ve scoured 160 countries, going back in the data 60 years,” he explains. “Why are economies as distinct and different as Chile, Estonia, Germany, Korea and Rwanda rockstars in building prosperity? Is it by good luck or by design? And if the latter, can we identify the ingredients that establish the bedrock for economic superstardom? Or, in the negative, the factors which when absent or rickety, all but guarantee stumbling and stuttering growth?” There’s a cogent argument we can. Saville’s work demonstrates strong explanatory power of sustained improvements in socioeconomic prosperity by identifying six factors that are resident in the case of every so-called “economic miracle”: the Saville Six Factor Model or, more colloquially, the Saville Sixpack. Not entirely unexpected are the elements captured in Figure 1 below. The wisdom lies more in the elements that fail to make the grade. 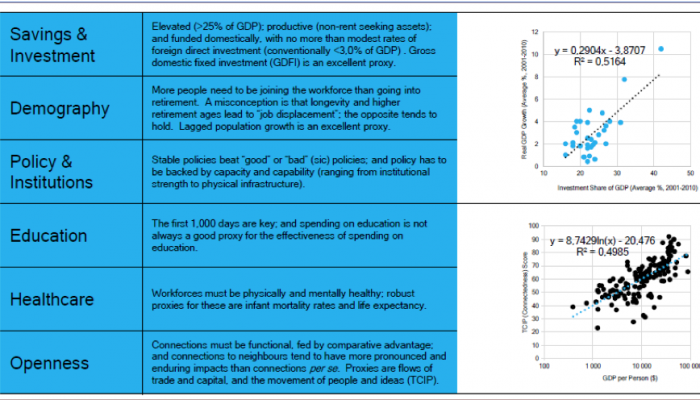 Saville’s Sixpack: Six powerful determinants of a healthy foundation for long-term economic growth. First, consider the most glaring exclusions. Political arrangement would seem a shoo-in. The Western mind leaps immediately for democracy ahead of some form of authoritarian rule as a substrate for prosperity. Economic philosophy is another favourite pick for the Sixpack, with the Washington Consensus insisting that free markets – albeit with some public goods – are the route to growth. But neither political model nor economic school of thought packs the punch for Sixpack status. “Barring extreme regimes, the positivity of a sustained, healthy and inclusive growth environment is almost agnostic of these aspects,” says Saville. Several examples rebut the conventional wisdom that democracy and free markets possess a monopoly on creating growth environments. One such example is Rwanda – small, hilly and landlocked – and under the firm-handed rule of Paul Kagame, who has been in power for 18 years. Just 25 years after a horrific genocide, Rwanda boasted 10.6% year-on-year economic growth in the first quarter of 2018. Then there’s socialist-leaning Vietnam, where growth has cycled between 5% and 10% with enviable consistency since 1990.” So, the first insight from the Sixpack is that stable policy and capable institutions trump political arrangements and economic philosophy, almost regardless of their content. Now consider the proxies for the six elements. Breaking down education, the model shows that what really matters is the first 1 000 days in early childhood development, rather than advanced degrees. Also in need of a deeper dive is the make-up of a positive demography score. “More people need to be joining the workforce than are going into retirement,” summarises Saville. Here Africa looks good. Its demographic shape is Kardashian-esque – substantial at the bottom – in this case indicating a growing young population. The global situation shows no such wealth of future entrepreneurs, investors, innovators, consumers, taxpayers and funders of pay-as-you-go welfare systems. 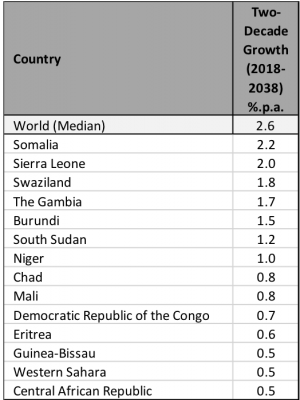 Growing Up Strong: No shortage of youthful Africans to drive future growth. At a time of increasing appetite for trade barriers – stoked mainly by Sino-American relations – the factor of “openness” points in the opposite direction. More flows of trade and capital across human-made borders, alongside uncomplicated movement of people and ideas, are what is needed, not less. That said, this marker conceals a potential anomaly: more can also mean worse, depending on the nature and extent of openness. Refugees fleeing conflict, ivory smuggling, human trafficking, war and flouting of international intellectual property agreements do not feed mutually profitable outcomes. Also critical to understanding the Sixpack is the fact that not all elements are equal. The bulk of explanatory power sits in just two factors: 1. elevated levels of savings that fund and fuel productive investments; and 2. functional openness that feeds win-win integration. 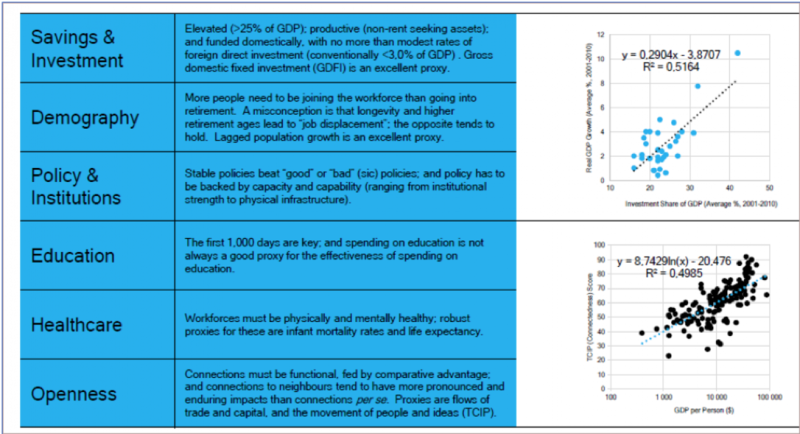 Put together, these two factors explain about two-thirds of the gains in country prosperity over the last 60 years. This relevance to the long-run determines who and what type of decisions the model is most applicable to. “When these elements are robustly in place, and an economy starts growing, this expansion develops inertia,” says Saville. 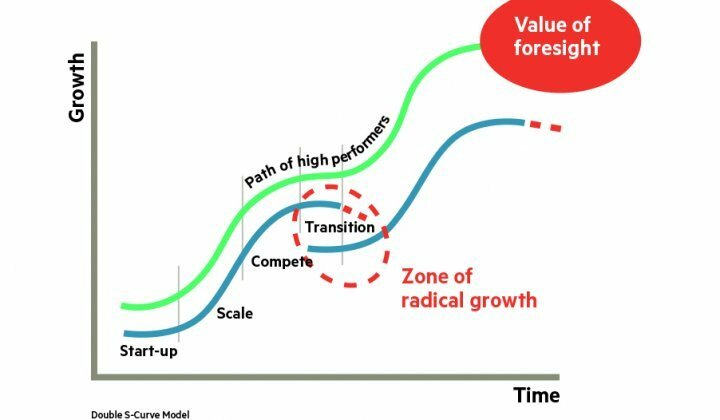 “So, the value of the six-factor model is its power when considering which country to invest in – not via flows of hot money into shares and government bonds, but by moving operations and human and physical capital with a consequential time horizon. Other caveats apply. Perhaps the most critical warning is that even if a country has the six elements in place, this is not an assurance of an outcome. Countries can lose their way – Turkey is a case in point; or they can squander early improvements in structural elements – just think of Venezuela. Armed with these half-dozen core economic muscles, we can make our first exploratory inroads to shortlisting destinations for expansion. Let us start with a conservative removal from consideration of countries our model most clearly flags as structurally ill-designed for healthy growth. The six-factor model points to a global average GDP growth rate of 2.6% per annum for the coming 20 years. 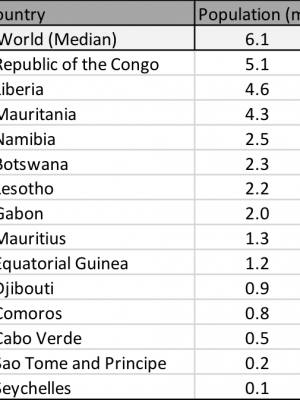 Of Africa’s 55 nations (including Western Sahara), 14 countries fare worse than 2.6% on that same yardstick. It would seem uncontroversial to screen them out at this early stage. And if the world average seems an arbitrary guideline, it is. “There’s no real science behind this threshold,” says Saville. 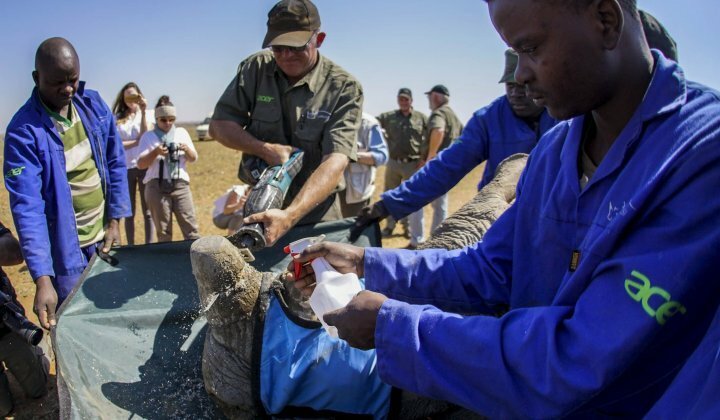 “But it’s a useful start – these economies are structurally stuck in low- or no-growth frameworks.” Local readers may breathe a sigh of relief to learn South Africa clears this hurdle with 3.1% growth structure. 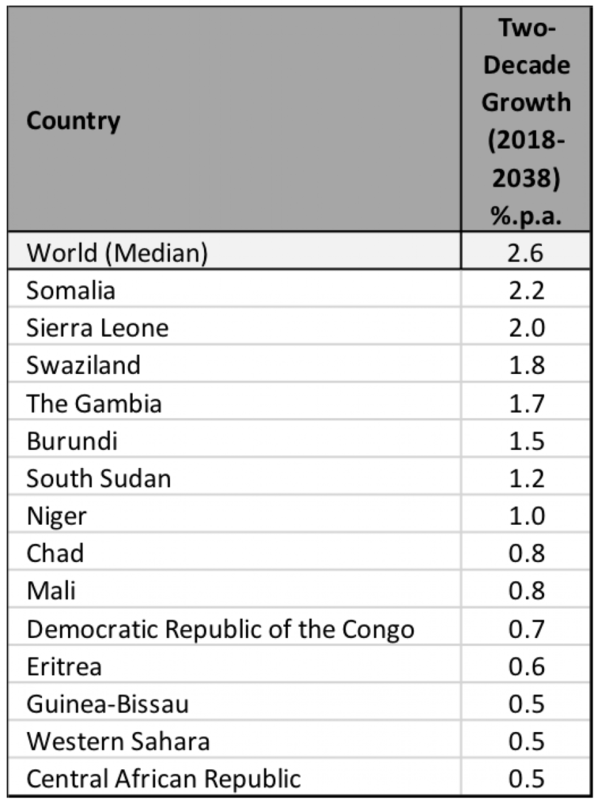 14 African countries fall short of the world median of 2.6% per annum two-decade growth forecast by the six-factor model. 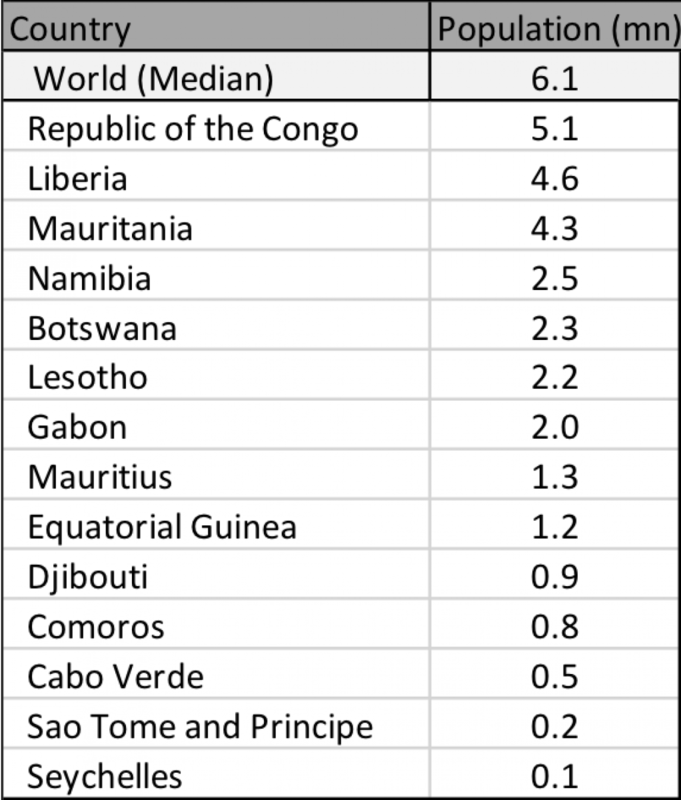 A further 14 African economies have populations smaller than the world average of 6.1 million people. With a second screen we can cut out of consideration a further 14 economies we don’t want to cloud our more detailed analysis. Again, it is by a blunt sword’s edge, and we eliminate countries with a population size smaller than the world median of 6.1m people. Fewer customers means less opportunity to scale. With our list of 27 structurally solid economies of substantial size, we’re ready to holster the blunt sword and take aim with laser guidance. Our weapon of choice here is based on the CAGE Distance Framework devised by Pankaj Ghemawat, professor of Global Strategy at IESE Business School in Barcelona and Global Professor of Management and Strategy at the Stern School of Business at New York University. In his MBA course, Globalisation of Business Enterprise, Ghemawat asks students why US media giant Star TV lost $500 million trying to deliver TV shows to Asia, assuming this booming market wanted English-language programming, but succeeded later in India with the same product. Ghemawat suggests the answer: “Look beyond a country’s sales potential (as expressed by national wealth or propensity to consume) – and analyse the probable impact of distance.” Here ‘distance’ is a term of art as much as it is of science, made up of four varieties, only one of which is geographic. “Cultural difference is a good jump-off point,” says Saville. “We want to know the degree to which we would feel at home in this country. 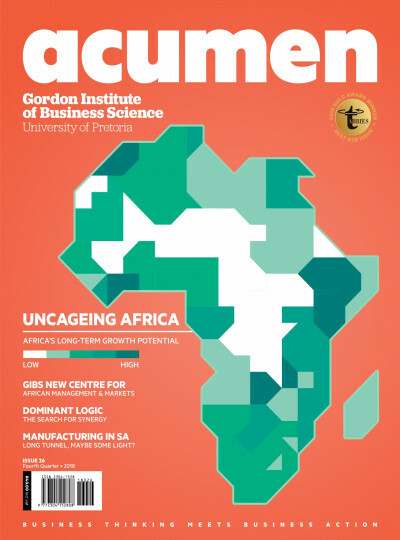 We know that, for example, in mergers – one of the likely vehicles for expansion across borders – it is cultural rifts that result in failures far more often than a bad product.” For Africa, Saville asked how different country X’s language, ethnicity, religion and work systems are from those of South Africa. The further apart the proxies, the more difficult and riskier the location for expansion. 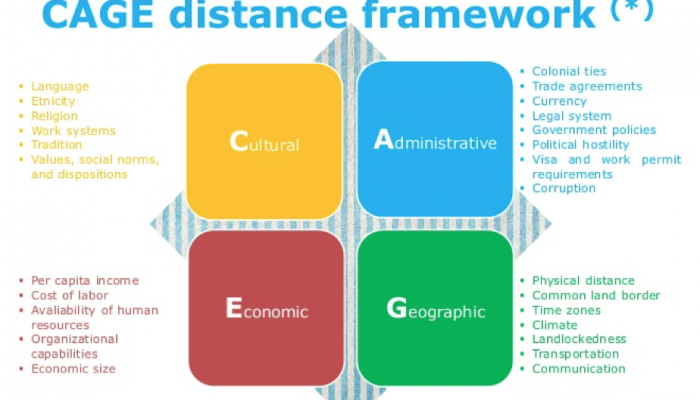 Similarly, administrative distance belongs in the CAGE model. Do we share trade agreements? Are our legal systems compatible? Are regulatory systems hostile? That’s clear enough. Saville pares down geographic distance to “How much time in how many airports?” One might gloss over differences in time zones and climate until that 3am conference call or a week of equatorial summer. We want the CAG elements of CAGE to be close. 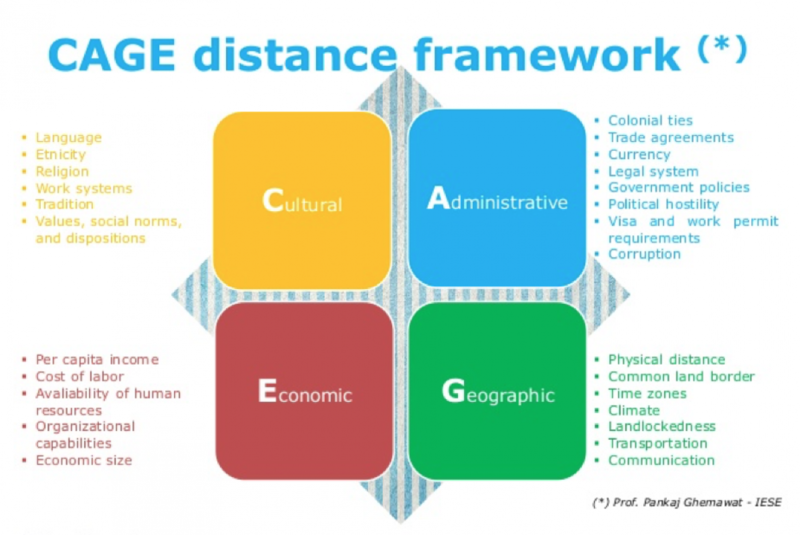 The E – economic distance – is more nuanced. “This is an ambiguous element,” explains Saville. 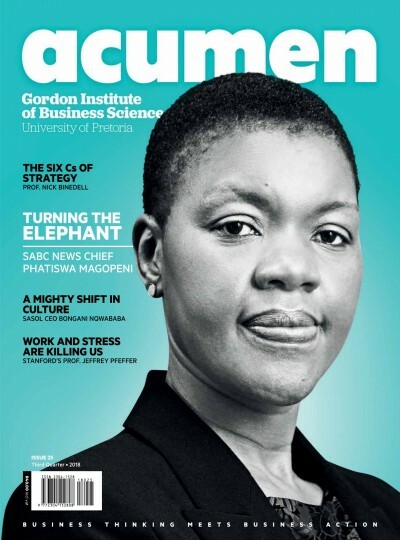 “We don’t necessarily want to go to a place that shares our cost of labour, size and human resources. At the extreme, if our economies are identical, why would they want anything we have?” For example, a manufacturer might gravitate towards substantially lower labour costs. A web start-up may chase a more technologically skilled workforce. It all depends. Saville applies the CAGE model to the shortlist of other African destinations for the South African firm considering expansion. Each country scores between 1 and 3 for each element of CAGE, 1 being the best score and 3 the lowest. Summing scores across the elements, a perfect score is 4, while a score of 12 points to high distance and suggests a host of challenges. We have combined our models to whittle down an intimidating smorgasbord of 55 potential destinations for expansion to 21 investible African countries for the South Africa-based business. That figure remains beyond most market research budgets, making one final screen important. Eliminating from the discussion all economies with a CAGE score of 8 (the average across our list of 21 finalists) or higher leaves ten economies standing. That is ten countries of substantial size that we are confident will grow well in the long run and are suitably ‘nearby’ (as CAGE defines it) to justify moving in for the long haul. Of course, our dismissal of commercial intuition earlier was only partial. The Sixpack and CAGE treatment got us this far, it remains for some combination of business wiles, industry specifics and CAGE distance to cover those vital final yards to an investment decision. 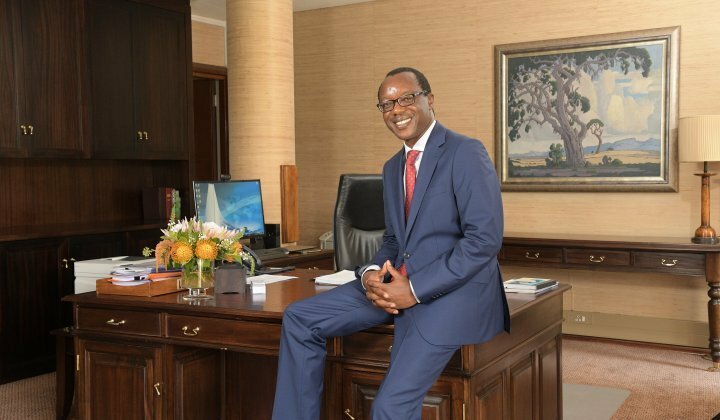 Less is More: Four countries – Kenya, Ghana, Rwanda, Zambia – with a perfect CAGE score of 4 and attractive prospects for the expanding South African business. Consider also Ghana. 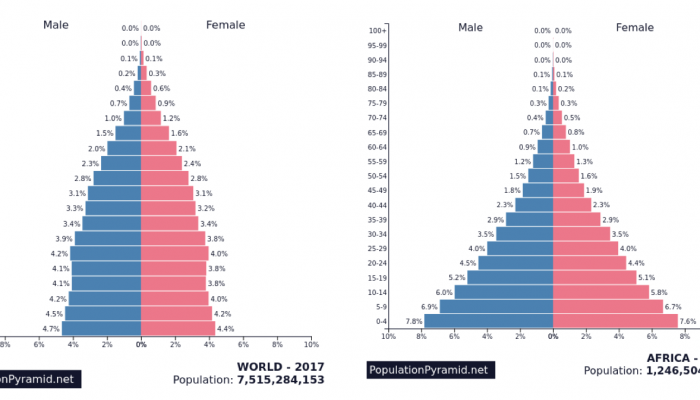 At 29 million its population is one-sixth that of Nigeria, and yet Ghana’s top-of-the-log score of 4 trumps Nigeria’s by two points. 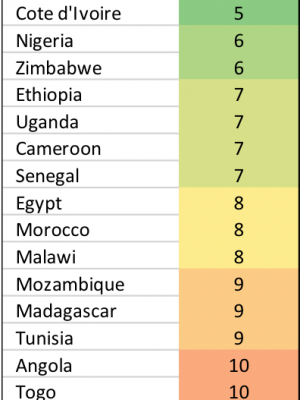 Geographically further from South Africa than Nigeria, Ghana is ‘closer’ on CAGE ranking. Add to that a stable democracy, natural resources alongside better diversification of industries than many African peers, sandy white beaches and warm weather year-round. Pause for thought indeed. Despite its ubiquitous status as the go-to measure of economic growth and, by implication, happiness and prosperity, GDP (or GDP per capita) is an undeniably flawed yardstick. It says nothing about the ‘goodness’ of any spending for the economy. It equates a rand’s worth of crime-scene clean-up and a rand earned by a thriving tech start-up. Salaries for jobs that make us unhappy are just the same as fulfilling work for a recent graduate. Almost entirely unmeasured are the informal sector and the ‘work’ we do without pay: caring for our children, volunteering.